This document lists which Lenovo System x, NeXtScale, Flex System, and BladeCenter servers support the Integrated Management Module II (IMM2) service processor and the older Integrated Management Module (IMM) service processor. The IMM and IMM2 consolidate service processor functionality previously provided by the combination of the Baseboard Management Controller (BMC) and the Remote Supervisor Adapter II in System x and BladeCenter products. Integrated Management Module II (IMM2) is the second-generation management module integrated on System x servers. IMM2 offers three levels of functionality: Basic, Standard, and Advanced. Upgrading to Standard or Advanced will be performed using a software license key using Lenovo Features on Demand (FoD). Note: IMM2 Basic does not include web browser or remote presence capabilities. Virtual media allowing the attachment of a diskette drive, CD/DVD drive, USB flash drive, or disk image to a server. For servers with an SD Media adapter installed, you can configure volumes on those SD Cards for use by the IMM. Note: For servers where only IMM2 Basic is installed (for example, x3100 M4, x3250 M4, nx360 M4), the use of IMM2 Advanced requires IMM2 Standard also be purchased and enabled. The following table lists the IMM2 upgrades. In older System x servers, the Integrated Management Module (IMM) consolidates the service processor functionality, Super I/O, video controller, and remote presence capabilities in a single chip on the server system board. The IMM consolidates service processor functionality previously provided in the BMC and the Remote Supervisor Adapter II in System x and BladeCenter products. Lenovo offers two levels of IMM, Standard and Premium. If the server has IMM Standard functionality, it can be upgraded to IMM Premium by purchasing and installing a Virtual Media Key (either part number 46C7526 or 46C7527, depending on the server) on the server system board. This key is a physical component (Figure 1). However, no new firmware is required. IMM Premium provides Remote Presence and Virtual Media capabilities. Figure 1 shows where the Virtual Media Key is installed in one of the supported servers (x3620 M3). 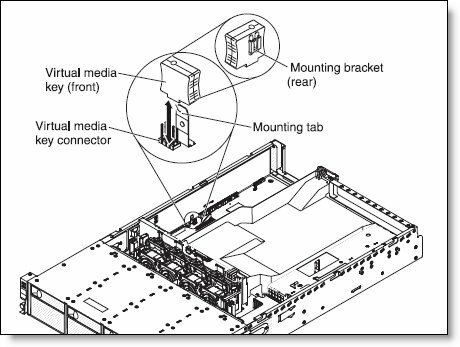 The following table lists the available Virtual Media Keys and their part numbers. Table 3 lists the key used in each System x server. Note that three different part numbers exist. The parts are keyed to prevent insertion into the wrong system. Withdrawn: All three part numbers in the table are withdrawn from marketing. System x servers include either the Integrated Management Module II (newer systems) or the Integrated Management Module (older systems). Standard: This level of functionality of IMM2 comes standard with the server. Upgrade: This level of functionality of IMM2 can be purchased as an option and enabled via Features on Demand using the indicated part number. No: The server does not support this level of the IMM2 service processor. * For systems with only IMM2 Basic standard, the IMM2 Advanced upgrade requires IMM2 Standard (90Y3900) also be purchased and enabled. Standard: This IMM comes standard with the server. Upgrade: This IMM functionality can be purchased as an option via the Virtual Media Key (VMK) explained using the indicated part number. No: The server does not support this version of the IMM service processor. * The x3755 M3 includes an Aspeed AST-2050 Baseboard Management Controller (BMC). This BMC is different from the BMCs in earlier servers and includes the IMM Premium feature set. Flex System compute nodes include the Integrated Management Module II and all have IMM2 Advanced enabled. The BladeCenter Management Module (MM) and Advanced Management Module (AMM) are the central points of management for the BladeCenter chassis. As such, when the AMM is not responsive, the ability to perform normal management on the chassis is significantly compromised. The AMM is Version 2 of the MM. The main differences are that the AMM is USB based (instead of PS/2) and also has a feature to save service data. The service data collects most of the useful information that is required to support the AMM. Each BladeCenter chassis, with the exception of the BladeCenter S, supports a redundant pair of management modules. The two management modules used in a chassis must be identical. The Advanced Management Module for BladeCenter S, BladeCenter E, BladeCenter H, and BladeCenter HT is part # 25R5778. The Advanced Management Module for BladeCenter T is part # 32R0835. The original MMs have been withdrawn but were only supported in BladeCenter E (BC-E, part # 48P7055) and BladeCenter T (BC-T, part # 90P3741). All BladeCenter chassis models with the original MM installed can be upgraded to an AMM. In fact, most current servers require that the chassis have AMMs installed. The following table lists the service processors that are standard and optional in each BladeCenter chassis. BladeCenter E, machine types 8667, 1881, 7967, 8760 Some models have the MM standard. Some models have the AMM standard. BladeCenter T, machine types 8267, 8720, 8730 Some models have the MM standard. Some models have the AMM standard.